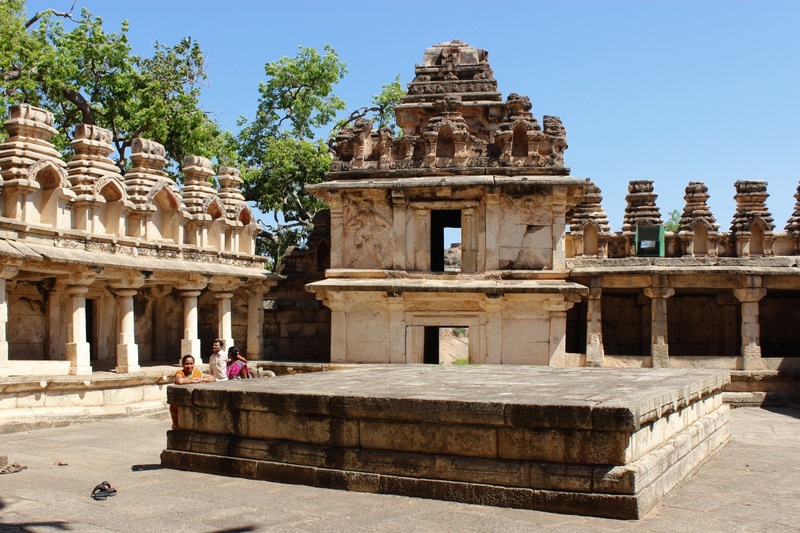 Within the walls of Chitra Durga fort are eighteen temples of which the well known ones are Hidimbeswara Devasthana, Sampige Siddeshwara Devasthana, Ekanathamma Devasthana, Phalguneshwara Devasthana, Gopala Krishna Devasthana, Anjaneya Devasthana, Subbaraya Devasthana and Nandi Gudi. 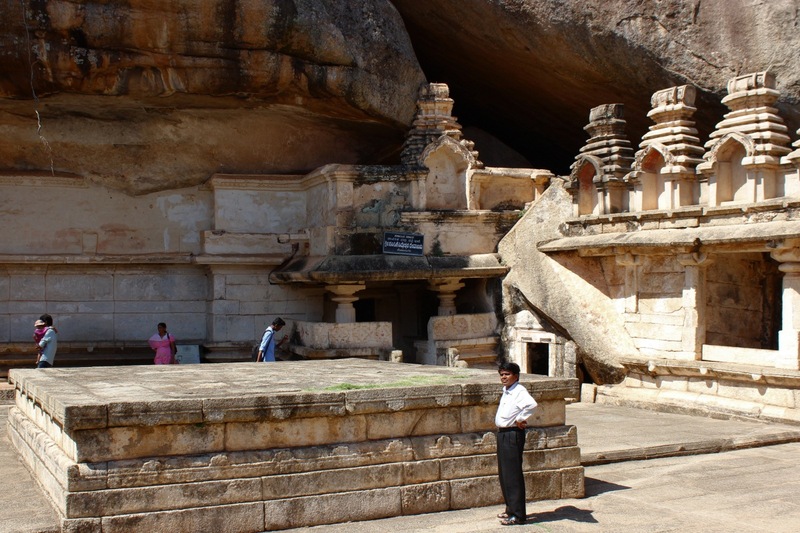 Also within the fort was Murugarajendra Matha, Lingayat monastery which is now situated about 2 kilometres away from the town on Chitradurga - Davangere road. I'd travelled from Dharwad early morning. I'd planned to spend half day at Chitradurga and then move on towards Chandravalli, Channagiri fort and reach Badhravati by nightfall. 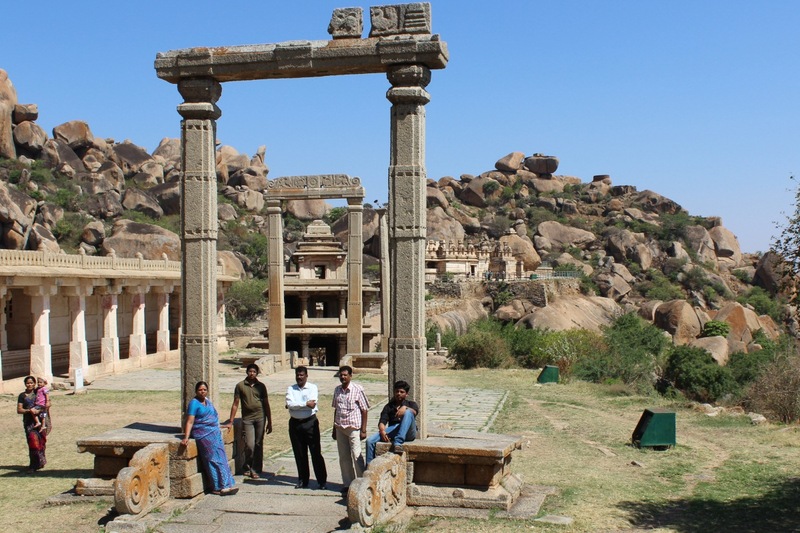 This was my third visit to Chitradurga. 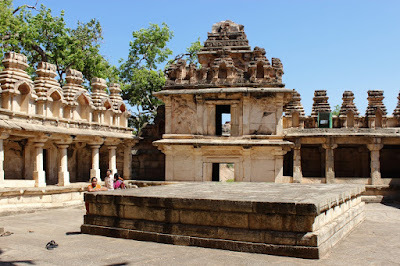 The primary destination within the fort was to see Venkata Subbayyana Kallu, the spot where the lead character of the movie Hamsa Geethe spends his final days. 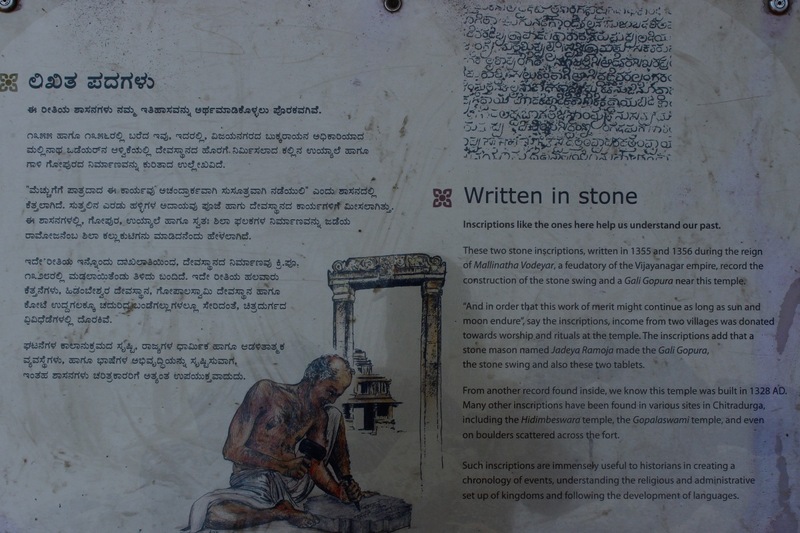 So I started off with the gunpowder mill, the oil tank and then reached Sampige Siddeshwara Devasthana. Yeah, I'd hired a guide to show me the popular spots of this formidable fort. Here I'm standing in front of Sri Sampige Siddeshwara Devasthana. It is said to be named after the Sampige tree which was supposedly planted by the ancestors of Chitradurga ruler Madakari Nayaka. This temple is situated at the base of a massive rock formation. Atop the rock formation is the Kavalu Battery ~ the sentry tower. The massive pillars supporting the beam atop is actually an arrangement for a swing. I guess the swing was for religious purpose, to place the deity in a cradle and swing it during a festival. Notice the two blocks on the beam, the one on the right has a tapering temple tower which can be seen on the temple walls too. This is one of the Sampige trees in the temple. The tree does look old but it may not be 300 years old. 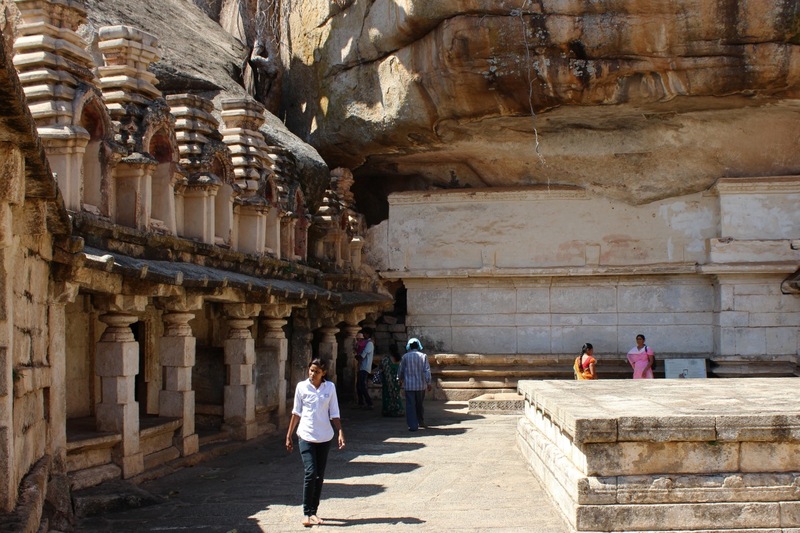 This is the temple's courtyard, on the left is the temple's front wall and on the right is a square shaped platform. The courtyard as seen from another angle. In the corner is the temple's entrance. As you see, its nestled under the massive rock formation. 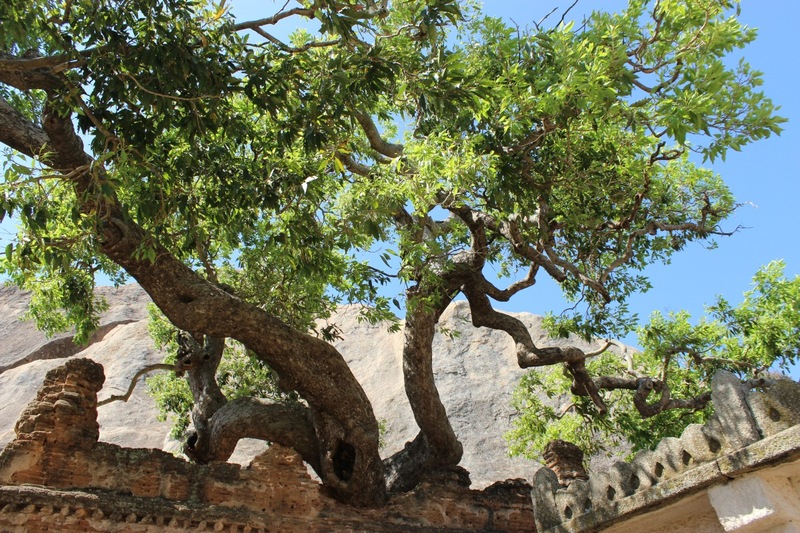 At one of the corners is an old Sampige tree, not sure if this is the tree planted by the rulers of this fort. The two storey tower known as the Gali Gopura ~ breeze tower. The temple has a peaceful ambience. I wonder how the place would be during a full moon night after a good rain. I'm sure the place would be cool and pleasant. Inside the temple are few sculptures of which here are two which caught my attention. The first one depicts a pair of warriors. 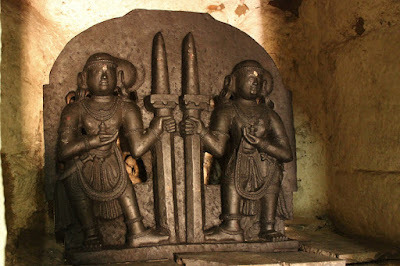 Since this fort is connected to Vijayanagara kingdom closely, I'm guessing this pair must be Hakka and Bukka, the founders of Vijayanagar empire. This is Lord Veerabhadra, an avatar of Lord Shiva. 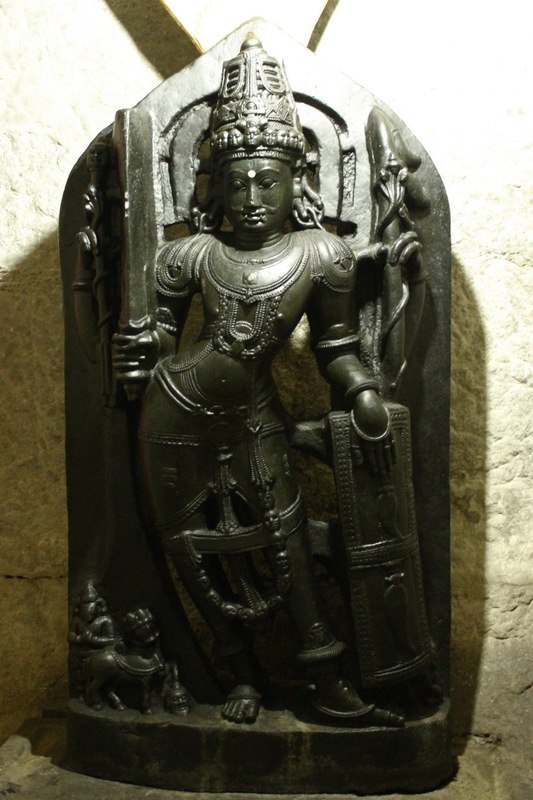 This sculpture seems to be of Hoysala times. This temple itself has roots going back to Chalukyan times. 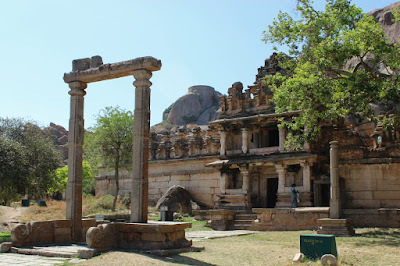 Also, within the temples are two inscriptions of Vijayanagara times. The person seen here was a guide..
A signage with the temple tells a bit about these sculptures.. 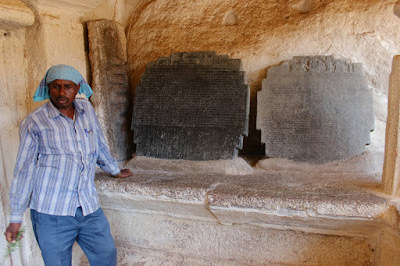 These two stone inscriptions, written in 1355 and 1356 during the reign of Mallinatha Vodeyar, a feudatory of the Vijayanagar empire, record the construction of the stone swing and a Gali Gopura near this temple. "And in order that this work of merit might continue as long as sun and moon endure", say the inscriptions, income from two villages was donated towards worship and rituals at the temple. The inscriptions add that a stone mason names Jadeya Ramoja made the Gali Gopura, the stone swing and also these two tablets. From another record found inside, we know this temple was built in 1328 AD. 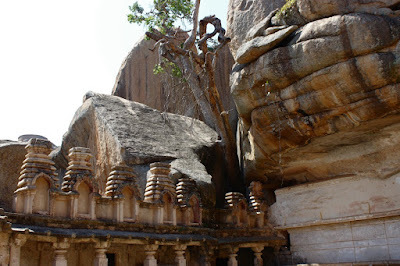 Many other inscriptions have been found in various sites in Chitradurga, including the Hidembeshwara temple, the Gopalaswami Temple, and even on boulders scattered across the fort. Such inscriptions are immensely useful to historians in creating a chronology of events, understanding the religious and administrative setup of kingdoms and following the development of languages. Wonderful description of the this temple inside Chitradurga Fort. Very well narrated Siddheshwar.. I always use your blog as reference while travelling to places in Karnataka..